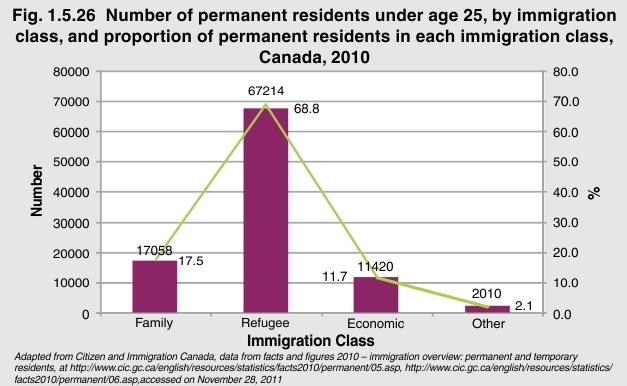 In 2010, 280,681 immigrants became permanent residents of Canada. Of those, 97,702 were children and youth between birth and 24 years of age. Of the permanent residents under age 25, 67,214 received residency status under the Economic immigration class. Of those who immigrated to join family members already living in Canada (Family class immigrants), there were 17,058 children and youth. Another 11,420 people under age 25 obtained permanent residency status in Canada as refugees after fleeing their home countries.